From late July to early September, the night skies over the whole of Japan will be illuminated with fireworks at some point. Most of the festivals and events around the country are for the giving of thanks and appreciation for the prosperity in their own regions. On the whole, they will all include fireworks and parades as a matter of course but this is not the end of the matter. Each festival brings in hundreds of thousands of spectators and of course, funding to each area. The parades will generally include the carrying of the local deity (Kami) through the town on a Palanquin – aka Mikoshi (a carried cart). This is the only time of the year when the Kami will leave the shrine. 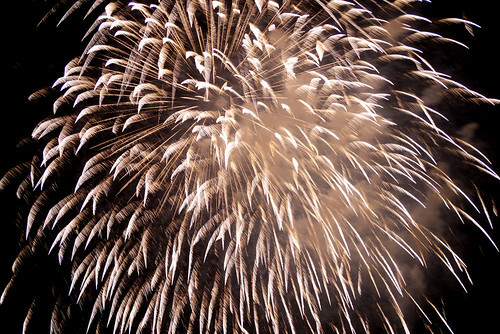 Most of the festivals include a huge number of fireworks in all forms but there will be a large concentration of the super shells Japan is famous for. There will be food concessions all day, various performances of traditional dance and music and even dragon boat races. The area of Kyushu for example, where they hold the Sasebo Seaside Festival they launch super shells which have a burst which is more than half a kilometer across reflecting on the water. They also hold a massive ‘tug of war’ competition. Over in the Nagaoka, the first day of their summer event is dedicated to the 1486 people who lost their lives on 1st August 1945 during the bombing of the area by American allies. There were many more casualties of the war and in fact, Japan lost over 2 million people during the hostilities. The Nagaoka Rehabilitation Festival began one year after the end of the war. During the daytime, they hold a parade where the children of the region carry a wooden statue of Jizo through the village where fresh water is splashed over it for good health. As evening falls, a 25 foot high pyramid created with 3,300 lanterns which look like a giant glowing Christmas tree. The late evening of course, is packed with beautiful fireworks. Over in Huis Ten Bosch, there is the largest Theme Park in Japan which has been operating for more than 20 years. The area has been created to look like a Dutch town. In spring, the area is covered in pink tulips. Come summer, the tulips are replaced by huge yellow sunflowers. Come the evening, the area becomes a magical Kingdom of Light at around 6.00pm with an organic electroluminescent display (fairy lights to you and I!!) a carriage parade and bright lights illuminate the streets, castles, palaces, canal and of course the Dutch inspired windmills. Another ‘must see’ is the Night Garden featuring 5000 sunflowers lit by LED lights. Fun is never far away and you can spend the afternoon with the family at the water park which has a huge outdoor pool and two super slides. Beautiful KujukuShima are a large bunch of small islands off the coast off the Nagasaki Prefecture where there is also an aquarium and you can take a boat tour around the islands. The place is the setting for the opening scenes from Tom Cruise’s The Last Samurai. Of course, as you would expect, the fireworks on display will be nothing short of magnificent, particularly as the Japanese are the masters of the big shell or ‘Warimono’. There are fireworks competition, festivals and displays all over the country from late July through to early September which are mostly for the entertainment of spectators. Collectively, they represent the whole of Japan and individually, they are in support of their local shrines, the people and the individuality of the region.